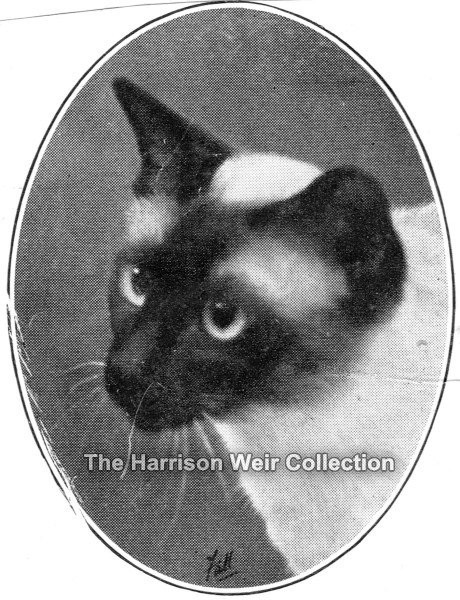 Many of you will have noted the post some days ago of a Siamese stud male named Champion BONZO. It was that male, who when mated to this superior female, Champion SIMPLE, produced the new generation winner, Ch.SIMZO. In this lovely photo by Fall, we see the extremely sound type of this lovely female, who was really very much ahead of her time. Note the definitively straight lines to the side of her head, which appears far more angular than that of 'Ch.Bonzo'. We also note te strong contrast of the point colour to body colour and the mask without blemish. Champion Simple was born 30th March 1925. Her sire, Robin Goodfellow, was linebred upon Ch.Carlisle Lad (1910) but also was a direct descendant of Ch.Sanch (1906) whom we will add a post about possibly later in the week.